This elegant 16th century town house contains rare examples of 16th century mural painting. 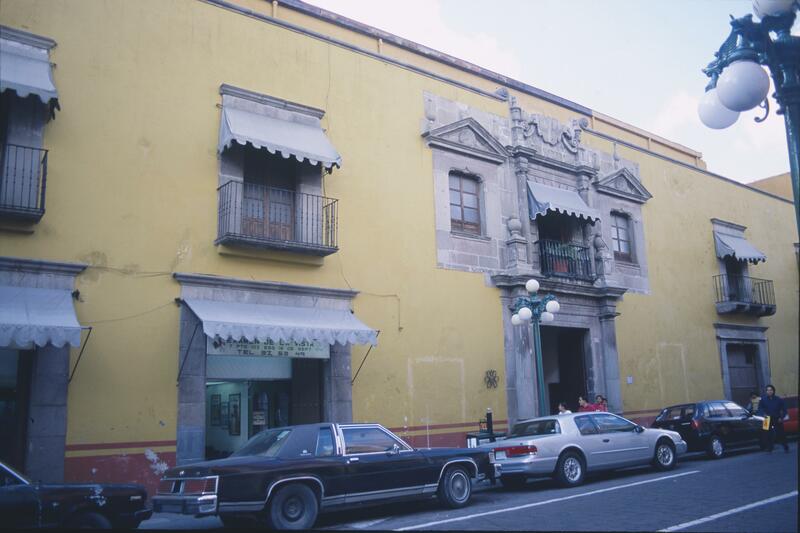 It was built by Tomás de la Plaza, who was dean of the Cathedral of Puebla, which lies just a block away. After his death, the house remained in the hands of his family until the 1950s. Subsequent owners destroyed much of the building, but two rooms of murals survive. 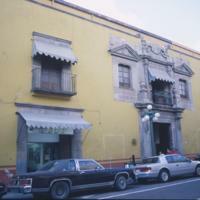 The sober façade shows the influence of Renaissance design in New Spain, with its two orders of classical columns, and heavy horizontal entablature. The Latin text above the main portal reads: “Semper sit in nomine ihv ingressvs et egressvs” (Always enter and leave in the name of Jesus), an appropriate inscription for the church leader who dwelt within. The owner occupied rooms on the second floor and many had interior windows overlooking a spacious open-air patio. Even in the 16th century, street level spaces were often rented out to shopkeepers. Tomás de la Plaza, the man for whom this house was built, became the third dean of the Cathedral of Puebla in 1569. The structure would have been built largely by indigenous laborers. Arellano, Alfonso. 1996. La Casa del Deán: un ejemplo de pintura mural civil del siglo XVI en Puebla. Puebla: Universidad Nacional Autónoma de México. Morrill, Penny. 2014. The Casa del Deán: New World Imagery in a Sixteenth-Century Mexican Mural Cycle. Austin: University of Texas Press.